Our company is the prominent manufacturer, supplier and exporter of Dental Chairs. Dental Chairs is available in market at reasonable rates and highly durable in nature. We are among the leading manufacturers and suppliers of a wide range of optimum quality Automatic Dental Chairs. In order to suit all dentists’ working positions, these automatic dental chairs are designed by using latest machinery. High-performance pneumatic technology used in their manufacturing ensures better performance and longer functional life. 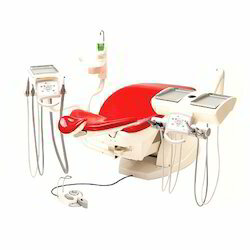 We offer a wide range of high quality Dental Chairs to our precious customers. The best quality materials are used for manufacturing of the offered range of dental chairs and these chairs are known for their seamless finish, robust construction and enhanced serving life. It is used in hospitals and dental clinics. Available in left handed and right handed. Looking for Dental Chairs ?